So Natural, the Austin, Texas-based Salvador's fifth full-length project for Word Entertainment, finds a band in near-constant motion taking time out to redefine their sound, refocus their energies and reflect on what they truly believe in, be it as musicians or men of God. "I think this is the record where we've finally captured our sound, and we're very excited about it," says Nic Gonzales, Salvador's lead vocalist, guitarist, primary songwriter and producer. "This is a record we feel, both as individuals and as a group, is the best representation of what we do on an everyday life level." 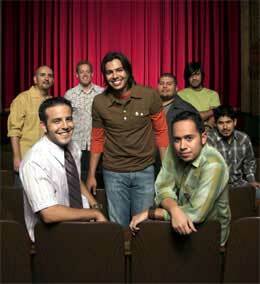 On a craftsmanship level, Gonzales and his bandmates-bassist Josh Gonzales, keyboardist Chris Bevins, trumpeter Pablo Gabaldon and new members guitarist Joel Cavazos, trombonist Jared Solis, percussionist Estaban "Chamo" Lopez and drummer Robert Acuna-took complete control of recording So Natural, aided by co-producer and music industry veteran Chris Rodriguez (Amy Grant, Michael W. Smith, Kenny Loggins, Shania Twain). "Salvador has built its reputation on playing live, and we hope that this record sounds like it's live because every sound-every loop, every instrument-is played by one of the guys in the band," Nic Gonzales says. "There are no computer tricks; everything was made by a hand playing an instrument. That was really important to us." At the same time, thanks to Nic Gonzales' interaction with talented songwriters including Rodriguez, Cindy Morgan, Dan Muckala, Rick Cua, Nick Trevisick and Jason Ingram, So Natural's lyrical and musical scope has widened considerably. Songs range from the truth-affirming "You Are There" and "Glimpse of His Heart" to "It Comes Back To You" and "For More Than Ourselves," which both call for street-level strength. Additionally, Salvador has tapped into a song by fellow Texas family band and musical kinsmen Los Lonely Boys, ably and humbly bringing the tune "Heaven" into So Natural's lineup as another reminder of tying the spiritual and physical planes together. "As a pastor's kid and being in church a long, long, time, I think I've become a little more aware of my surroundings," Nic says. "I don't want to walk into a church building and become oblivious to the rest of the world. When we started writing for this record, we took into account that we're all young men dealing with real issues and with real people. "It's hard to share Jesus with somebody and continue to tell them what we've heard all our lives, like 'God loves you' and 'Jesus died for your sins,'" he continues. "Not that those things aren't true, but we've heard them, and they probably have too. So we want to share some music that's interesting to their ears but also deals with everyday situations." But among the everyday situations within a band, especially one with Salvador's heritage and diversity, is change, and the infusion of new blood into their rich and dynamic sound has energized the band's veterans. "A couple guys left the band because they wanted to be with their families, and we always want to encourage family first," says Josh Gonzales. "We've since welcomed some new members, mainly Joel, Robert, and Jared. And then there's Chamo, who's just an entity unto himself. Josh continues, "They all love music and brought various influences with them. Chamo's very heavy into traditional Latin music; Robert is a huge gospel and R&B fanatic; Jared is a jazz-crazed dude, and there's stuff to learn from all these guys. They all bring something to the table that adds to the sound, and it's just perfect. I've loved the guys that have been with us before, but I'm having a blast with the guys we're with now." And the new guys are pulling their weight not only onstage but also in the studio. Joel Cavazos co-wrote So Natural's opener "Can You Feel (The Supernatural)"; Jared Solis along with Pablo Gabaldon contributed to the horn arrangements throughout, while Chris Bevins played a key role in multiple aspects of the album's development. Bevins co-wrote "This is My Life" and was responsible for its string arrangement; he assisted engineering, put in countless hours of additional recording, and co-produced the project's debut radio single "Heaven." Salvador's intricate involvement contributes greatly to the project's sonic richness and polish. "So Natural really took shape in the studio and that was a first," says Josh Gonzales. "Usually we have everything laid out prior to going in, but this time we had the chance to create almost all of it ourselves, which led to a lot of early mornings, late nights, waiting around and some frustration. Many times, we were saying, 'Are we ever going to finish this song?' But we were trying to find the right sound for everything, and I think we accomplished that. "Everything we've learned in the past, we brought to this album. If Salvador's sound was ever concrete, this is it," Josh proclaims. That excitement level over So Natural's connective power only heightens an already impact-filled career for this Texas-born band, a run that includes the 2004 Dove Award for Spanish Language Album of the Year (Con Poder), tours with artists such as Third Day and Jaci Velasquez, appearances for both Billy Graham and Franklin Graham Crusades, and many more accolades. Not bad for some kids from Austin, but the members of Salvador know their best path is to let God take control of where and how their music touches people. "We come from a small Hispanic church that on Easter Sundays has, like, 30 people," says Josh Gonzales. "For us to come from there and still go there when we're home, to see what we've seen in these last four or five years, it's certainly more than I ever expected. "To think about what we'd like to see happen over the next year or so, I know God will reveal something we could never have imagined. I don't know what's on the horizon, but God does, and he's going to show us in a big way." The band's newer members, to be sure, have the enthusiasm of youth washing over them, but still know the role this band can play. "What would I like to see happen? A Salvador explosion all over the nation. A Salvador phenomenon that sweeps the earth. And a shoe endorsement," laughs Joel Cavazos. "Seriously, I really believe in this ministry, and I'd like to see us keep going in the direction we're going. "These songs emerged from us just jamming, and the creative juices are still flowing. So Natural kind of revved up the engine a lot, and we're bound to keep this momentum." But ultimately, Salvador wants everyone to know the feeling they're most comfortable with, a full, trusting and constant relationship with God, such as the one expressed on "This Is My Life." "It's hard to be all about God when you're at work; it's hard to be all about God when you're playing basketball with your buddies," Nic Gonzales says. "But you can always be under God's umbrella of protection, and you need to set aside that time to visit God in prayer, a time when you can devote your mind, your body, every molecule to Him, and that's His time with you." It can be a hard thing to do. But when you think about it, it's really So Natural.